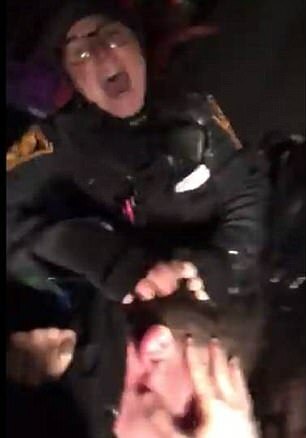 A group of police officers in Bridgeport, Connecticut, have been placed on administrative duty after they were caught on video apparently roughing up an 18-year-old man during an arrest and threatening his mother filming the violence to "get back or you're next." Though it's not clear what happened before or after the assault, the video, shot by 18-year-old Aaron Kearney's mother, shows the officers surrounding the teen and forcing him facedown onto the hood of a car. 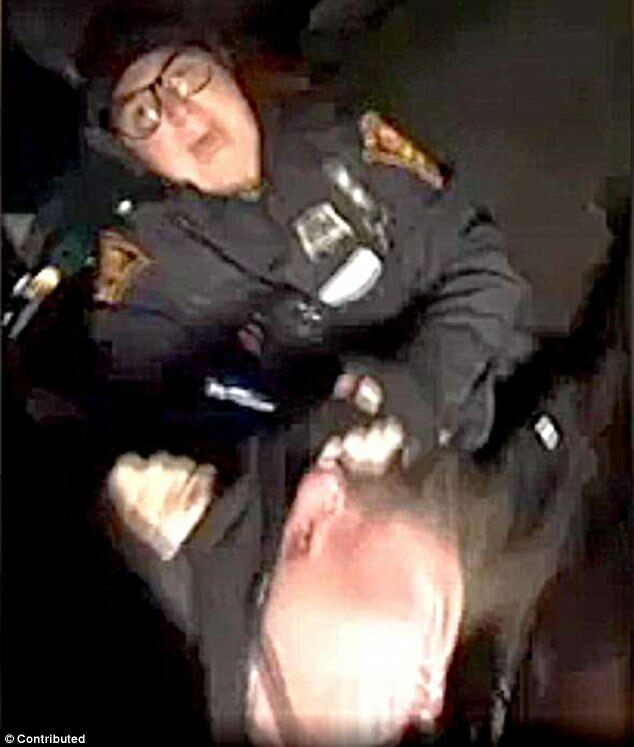 At one point, a female officer appears to hit the side of his face with her hand, and the others hold him down, as his mother shouts, "Don't hurt my son, don't hurt my son." At another point, Kearney's mother approaches the apparent violence and sobs "Are you punching my son?" The officer looks up and says "I am. Get back." The mother then walks around behind the officers and shouts "Why is she f---ing my son up? Why is she f---ing my son up?" The same officer then looks back at the woman and says "Get back or you're next." Kearney ended up in the hospital. "I know his nose was bleeding bad. I don't know if there were broken bones, but it looked severe that day," said Joe Grits, a close family friend and community activist, claiming the officers used excessive force and pulled the teen's hair. Grits says only minutes before, Kearney had called police about a minor traffic accident involving his car. Police learned he had been driving with a suspended license. It's not clear from the video how the traffic call became physical. Kearney was charged with breach of the peace and assault on a police officer following the incident. Bridgeport Police Chief Armando A.J. Perez declined to comment to News 4 on camera, but released a statement saying that any police officer who knowingly used excessive force will be "separated from their employment with the Bridgeport Police Department, and where applicable, arrested and charged with a crime." CTPost.com reports Perez has placed several officers on administrative leave and ordered he city's Office of Internal Affairs to investigate. Kearney's family said he's a good teen, was captain of his high school football team and has never been in trouble before.